The Clandestine Cake Club is a wonderful thing. Back in 2010 Lynn Hill set up a small local get together in Leeds for bakers and cake eaters to meet, eat and talk. No competition, no rivalry, just a chance to bake a cake and share it with others. Since then the cake club has spread nationally and internationally, with more than 150 clubs meeting, eating and baking. As a member, and more recently a co-host, of the Cambridge club, I have met lots of great people at the many meets I’ve attended and we’ve talked about everything from the frustrations of buttercream, our thoughts on Paul Hollywood and the best cake tins. My cakey knowledge has come on leaps and bounds since I attended the first Cambridge club in 2011. 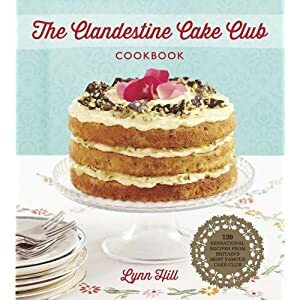 The Clandestine Cake Club cookbook came out last week, it is a collection of over 120 recipes from members of cake clubs, is this the very first crowdsourced cookbook? The book is beautifully photographed and there is such an array of different recipes that it is so hard to choose which one to begin with. The book is split into sections – classic cakes, Victorian cakes, fruity cakes, global cakes, zesty cakes, chocolatey cakes (of course), celebration cakes and creative cakes. There is also a brilliant section about the various cake disasters that can happen to bakers – refreshing to see in a cookbook as many do tend to paint a perfect world of cooking and baking. I can safely say I’ve had my fair share of undercooked cakes, melting buttercream and cakes stuck to the tin. Fortunately the book offers some advice for how to fix this, or prevent it in the first place. I’ve bookmarked about 12 recipes in the book that I must make soon, and for my first bake I thought it would be fitting to bake one of Lynn’s recipes. I chose the Orange & White Chocolate Cake – a classic sponge soaked in orange syrup and sandwich with white chocolate and orange buttercream. It is a delicious cake, quite sweet but the orange really helps to lighten it and make it seem not so naughty! The sponge recipe is straightforward and the buttercream not too difficult – I always find chocolate buttercream a little easier to make than standard as the cooling chocolate helps it to stay stiff and not melt so easily (provided your chocolate is cool). I’ll be trying to resist having another slice of this today, and then bringing the rest in for my colleagues to eat – which I think is in the spirit of the cake club – sharing cake! The Clandestine Cake Club Cookbook is available to buy from all bookshops and online. The Book People also have it for only £6.99 at the moment, which is a bargain. Pick up a copy, find your local cake club and get baking!